Xandria has been making a more committed push towards North America as of late, and with their latest release Theater of Dimensions in tow, it was time to time to finally deliver a headlining set (they had planned one for last fall, but it unfortunately fell through). First stop on this trek was in New York City, and Xandria brought with them a diverse billing in support. But still with one thing in common between the three acts – top-notch frontwomen with a strong live presence. Up first on the bill was that of groove/melodeath act Once Human. Making full use of their short, 5-song set to showcase their excellent new album, Evolution, they immediately cut to the chase with “Eye of Chaos.” The album saw the band really step up their game, and these tracks work remarkably well in the live setting. The bountiful grooves make for infectious headbanging and sound even more massive in person (“Killers for the Cure” gave some goosebumps), and the eerie/haunting feeling when the band slows down (“Passenger” or “Drain”) is not forgotten either – a key component in making the songs memorable. A good vibe and energy emanating from the stage, particularly vocalist Lauren Hart. Her caustic snarls perhaps topping what is on-disc, as she frequently moved across the stage, interacting and energizing the crowd with a friendly smile. With the band jumping on a few more upcoming tours in the US, they are bound to be turning plenty of heads and generating more buzz. 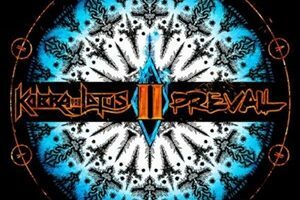 Building towards the now-released Prevail I, Kobra and the Lotus also took advantage of their time to give the crowd a good taste of said album. Sticking to already released tracks such as “Gotham” and “TriggerPulse” to open the set ensured the audience was already won by the time they laid into one of Prevail I‘s strongest and most epic cuts, “Specimen X (Mortal Chamber).” The band also played through “Hell on Earth” and “You Don’t Know,” which opened with vocalist Kobra Paige doing a fantastic solo intro before the song kicked into high gear. 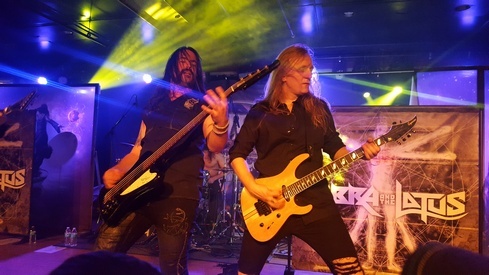 In addition to Paige’s charismatic presence (inciting crowd participation at every step as well), guitarist Jasio Kulakowski and bassist Brad Kennedy had plenty of fun interactions together (see above) to elevate the band to another level. They sprinkled in a few older cuts as well, with “Hold On,” “Soldier,” and “50 Shades of Evil” rounding out the set. With the new album equally riveting in the live venue as it is on disc, the band is truly positioning themselves to break through to something big. Adding to and enhancing the already impressive evening was, of course, that of Xandria. Releasing the excellent Theater of Dimensions at the start of the year, the album would get its due tonight (6 songs were included in the set). Cheers and anticipation already filling the venue as the band took to the stage to a one-two punch of “Where the Heart is Home” and “Call of Destiny,” the energy quickly went to fever-pitch. 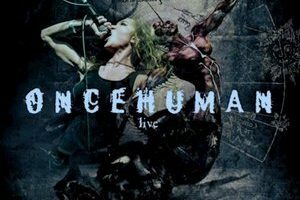 Vocalist Dianne van Giersbergen is the complete package as frontwoman for the act, hitting operatic highs and soothing melodies (both packed with emotion) with ease while almost constantly pushing for crowd involvement – be it a scream, clapping, or singing along. Topping it off with fun interactions with her bandmates and some occasional dry humor in her dialogue between songs, it’s hard not to smile as she commands the stage. 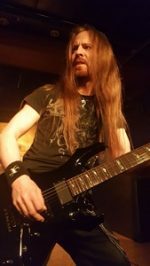 The rest of the band would not be slouching around either, with the guitar team of Marco Heubaum and Philip Restemeier and bassist Steven Wussow all zipping around the stage and keeping the audience on their toes while executing their parts with precision. It was even easy to tell that behind the drum kit, Gerit Lamm was clearly having a blast. 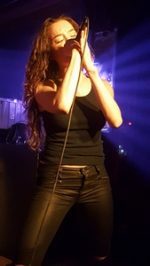 It’s that sort of infectious energy that many bands strive for, and Xandria has it in spades. Some additional highlights from their set included the sing-a-long friendly “Forsaken Love,” catchy fan favorite “Ravenheart,” soaring “Euphoria,” and the anthemic “Nightfall.” Of particular note was new cut “We Are Murderers (We All),” the band’s heaviest cut to date and it was a real scorcher to hear in person – also giving the crowd some added participation in the chorus. 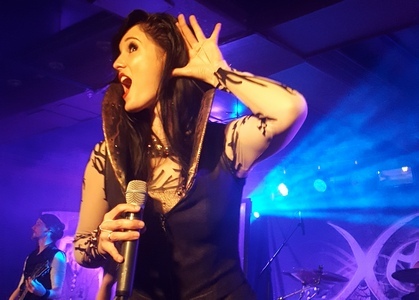 Xandria didn’t make fans wait too long for an encore either, with van Giersbergen quickly returning and asking the crowd to call out who should return next. The band wrapped with the bouncy and energetic “Burn Me” before bringing the show to a close with the thrilling and famous “Valentine.” Many have been clamoring for a headlining set from the band on these shores, and Xandria gave exactly the kind of performance that should more than satisfy those demands as well as generate new excitement. The first night of a tour can sometimes be a bit rough, but with these three bands already firing on all cylinders, this is a fantastic start to finish bill that should not be missed. There’s something for (almost) everybody with the diversity, and each one should be able to win you over by the end of their respective set.